What is a soul? How much can people change? How can a person’s family be oblivious to his complete transformation? Gene Yang answers questions about his graphic novel, American Born Chinese. These are questions Hillview seventh graders asked recently while reading Gene Luen Yang’s Printz-winning graphic novel American Born Chinese. The novel was based on Yang’s experience growing up in the Bay Area. Tuesday, he spoke with the students about his novel. Once they heard about the origins of the three story lines in the book, their questions transformed. Especially when they discovered that the character Jin Wang had a childhood similar to Yang’s. Did you grow up in the Bay Area? Did that really happen to you? Did someone really say that to you? Did you do something like that? 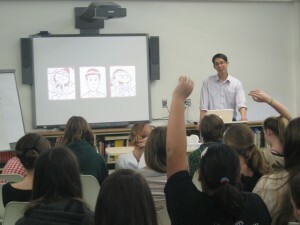 Yang’s honest answers helped these seventh graders understand how good fiction is created: from real experiences. Yang also shared the origins of the other complex story lines in American Born Chinese. Yang shared the many iterations of the popular character The Monkey King. As a boy, he heard stories about The Monkey King practically nightly. Yang’s own Monkey King is shoeless; a difference based on his own childhood conversations with his mother – and important to the book. 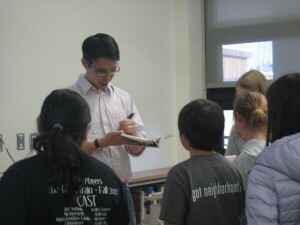 At the end of his presentation – and at the close of school – Yang was surrounded for more gracious Q & A and autograph signing. It didn’t hurt that his most recent books were Avatar. The program, Author Author, was funded by a Jeanie Ritchie Grant from the Menlo Park-Atherton Education Foundation and sponsored by Hillview librarian Tracy Piombo. 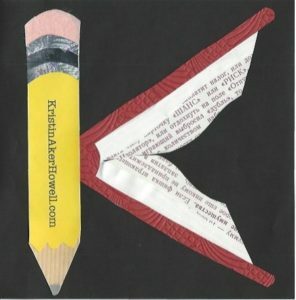 Kristin Aker Howell works for the Society of Young Inklings. I love American Born Chinese, I gave copies to friends as well!